I WORK EN PLEIN AIR, OUT IN THE COUNTRYSIDE… Welcome. I am back to painting again after a 4-year sabbatical that included a few pieces done for charitable fund raisers. While away from my easel and paints, we designed and had renovated part of our home, adding new studio spaces in the house and barn. Cynthia and I also rearranged the back woodlands. The initial reason was to make an 8 foot deep by 35 x 45 foot natural, swimmable pond and rocky stream, a couple of waterfalls and shallows on the sides for water plants and natural filtration. We easily surpassed that idea and began sculpting the landscape with abandon with the excavated dirt as if a small glacier had passed through the property! Then we rolled, dipped and planted the areas around and behind the pond creating new plein air studio spaces out back, building our own version of Monet's Giverny (paintable landscaped "park" with many different and varied garden rooms and destinations). I am now REALLY ready to paint!!! Come visit us and we’ll show you around. I am continuing to make small, 6" x 8", landscape oils, but not every day. I am also working on larger pieces. Every time I finish a painting, I will place it here on my website. For work prior to 2018, if you see something you’d like to purchase, email me. Thank you for enjoying my work and keeping me creating new pieces. Your interest stimulates and inspires me and has made me a better painter. Sign up for my emails and I will send you an image of each new painting. I love to paint and am happy to share my painting experience with you. Most of my work is impressionistic landscape oils, inspired by the beauty of the Island of Martha's Vineyard where I live. 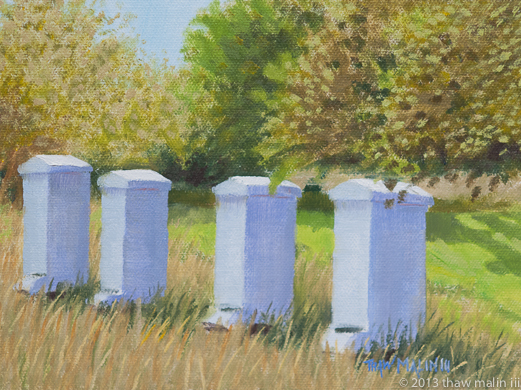 “Bee Home”, this is a small painting, 6″ x 8″, oil on canvas panel. This painting has SOLD.